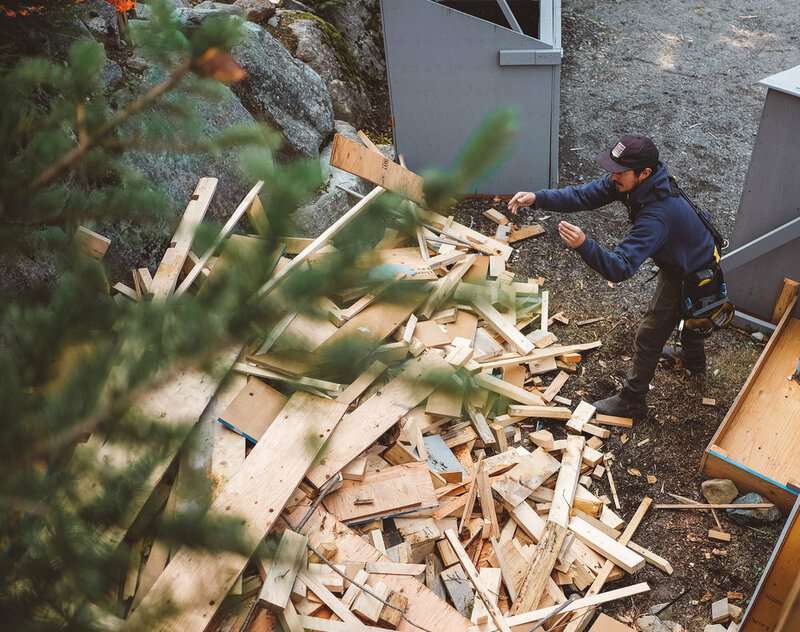 Sea to Sky Removal interviewed Built Green member Joe MacMullin owner and project manager of Adisa Homes Ltd about how one construction company is shifting their views on sustainable management practices. S2SR: Tell me about how Adisa Homes came into fruition. AH: I have been in the construction industry for 17 years. Within that time I climbed the ranks fairly quickly. Originally a carpenter by trade, I was brought into a management position at the age of 26. Since then I’ve had the privilege of working for some of the best builders in the Lower Mainland as a Project Manager. In that time I have also carved a space out in the custom contemporary home building market, working on some of Vancouver’s most notable and noticeable single-family homes. At the same time, making a name for myself with some of the most cutting edge architects in Vancouver. I eventually found myself working with people I love on projects that I love. The only thing missing was implementing a new system to be able to build, budget and manage projects in a new, progressive way. The only way to see the vision through to the end was to start up Adisa Homes Ltd and prove to the industry that the process can be as enjoyable and fulfilling as the end product. S2SR: Why is sustainable waste management an important component on your projects? AH: Wherever you look these days, you see society heading in a better direction with respect to the environment. I work hard but I play hard. When it’s time to play I play in Mother Nature’s backyard, the outdoors. Frankly I love this planet and this life we are living. One person can make a profound impact if they make their voice heard. My voice is a voice coming from the construction industry and it’s saying, “We can do better”. The hurdle is working with large budgets, and trying to choose green initiatives in your home, don’t always line up with budget expectations. The one area that I put my foot down on is waste management. The amount of waste that comes from construction sites is astounding. I knew this was a perfect place to lead by example and show our clients and colleagues that we can do much better for basically no extra cost. I see other builders make claims on being “Green Builders” but only a few out there actually have me convinced. It’s my hope that we can be an inspiration to others in the industry, and remove the stigma attached to green building practices being more expensive. AD: Can you explain how you set up your waste area? Every site needs to be approached with a long-term vision. We have a priority on waste management and we dedicate an area for it from the first day we prepare a site. Our goal is to place waste management in an area that (a) is convenient for our waste removal professionals to access, and (b) does not conflict with the structures built; usually an area that is landscaped in the end because we know it won’t have to be relocated during construction. Some sites can be challenging, but no matter what the size you have to work with, there’s always a way to make it fit. We then divide that area up into separate zones for all high volume waste materials. 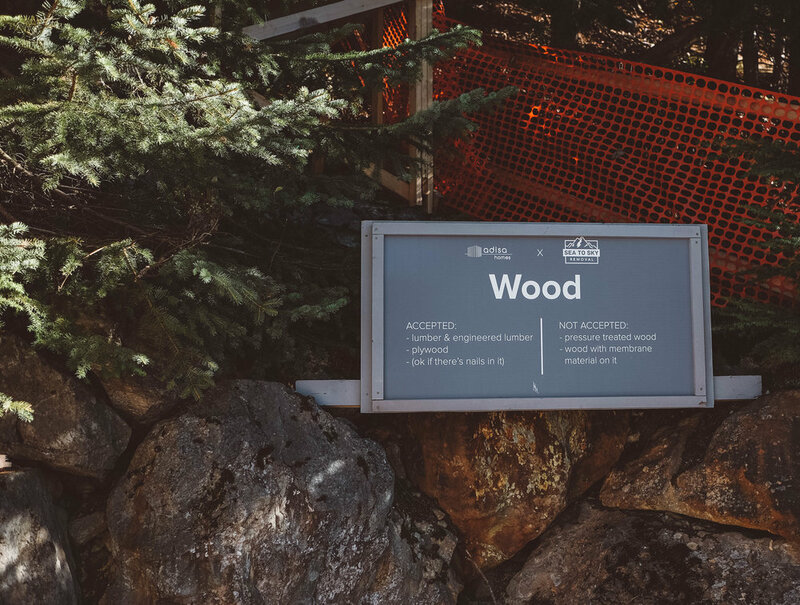 Wood tends to be the biggest zone, then plastic, metal and cardboard take up the next largest area. Organics are usually not larger than a single bin. After that the landfill waste zone, which should be one of your smallest areas. Finally you drive this message home clearly with use of signage. There are potentially hundreds of people that come and go from a job site during the course of construction. The signage is the final reminder to everybody to put some thought into how you dispose of your waste. For example, on our landfill waste area, our signage reminds you to look at all recyclable areas first, before just defaulting to throwing all your waste into the garbage. No system is perfect, and you need to stay on top of delivering the message. A good team and great collaborators make this journey an enjoyable one. S2SR: Tell me why you decided to go this route vs. the traditional one? AH: I didn’t just land here. I have grown to the place I am today. Along with my mentality in the industry, it’s grown to where it is today. I used to arrange a big metal bin, taller than me, and that’s where the ‘garbage’ went. I never used to care about diverting landfill waste. When that ‘garbage’ went into that bin, it was out of sight, out of mind. That mentality started changing once I started striving to be the best builder I could be. I try to stay humble in the industry in order to learn new things. Too many people in the construction industry stay in their routine and apply a copy and paste mentality to their profession. Once I started working on more progressive buildings, I knew that was the time I had to start practicing being a more progressive builder. Being a student of the game, I looked into all facets of the industry that I could improve in. Green building practices are constantly evolving and improving and I want to know that I’m at least trying to be on the forefront of that movement. Maybe it doesn’t mean I’m always building passive or Net Zero homes, but it certainly means I can look at every project and ask myself how we can improve. S2SR: What have you learned through this process? AH: The single most important thing I’ve learned is that having an environmental agenda does NOT blow the budget. Or at least it doesn’t have to mean that. Choosing your battles and pre planning the initiatives you want to implement just become a part of your routine. I’m also happy to say that I’ve learned the impact you can make is contagious. When people see you doing it the right way, and having pride in it, they get on board with your vision. I have the good fortune of being in a position where we can actually showcase our vision, with simple things like our waste management system on our sites. Don’t believe me? Come for a visit! S2SR: If you had the superpower to be able to recycle a certain building material, what would that be? AH: That’s a great question! Probably PVC and ABS. The harder you make things to dispose of, the less likely the masses will put their best efforts in disposing of it. Simpler, easier recycling solutions for PVC and ABS would be a great use of a superpower. S2SR: Do you have any advice for builders who want to take the lead on landfill diversion but don't know where to start? AH: My advice would be to start slow and be in it for the right reasons. Don’t go too fast in wanting to prove your point. Researching whom you want to align with and learn from is your best first step. If you try to jump right in without doing your homework, you might be one of those builders who say waste management is ‘expensive’ or ‘not worth it’. Working with the wrong people can also make your job more complicated, and possibly scaring you away from your initial goal. But the biggest thing is caring. Nobody can care for you, but they will get behind you if you actually care. Once you care enough, your team will care as much as you. Then you’ll stand there one day and realize that you’ve actually made a difference. Don’t know who to call? How about the fine people at Sea to Sky Removal? How about us at Adisa Homes? We can show you examples of what it looks like to care. If you feel stuck on where to start we would be happy to consult with you about waste management best practice and also set you up with our award-winning recycling stations so you can become a landfill diversion hero! – Originally published on Sea to Sky Removal’s blog on Sept 28,2018. Photos by Tianna Grey.